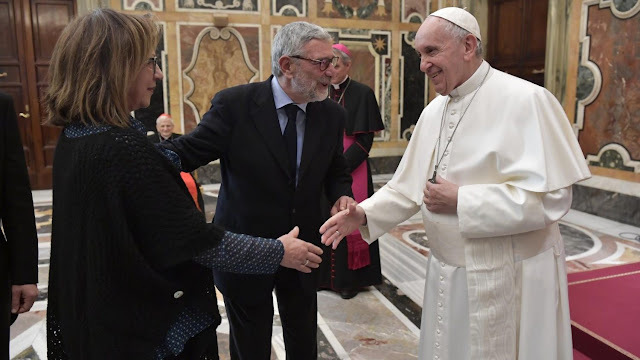 Catholic News World : Pope Francis "...Jesus Christ, who marked and redeemed so deeply the history of man to mark the passage of time in a first of Him and a later of Him." Pope Francis "...Jesus Christ, who marked and redeemed so deeply the history of man to mark the passage of time in a first of Him and a later of Him." I welcome you and thank you for your visit, very welcome. I thank the President for his introduction, in particular for having reminded us all of the ancient saying "historia magistra vitae", a very significant maxim linked to your important and generous teaching. A friend of your "founding fathers" and of your Association, the Jesuit priest Giacomo Martina, an acute historian of the Church, long teacher at the Gregorian and teacher of many of you, tell me that he used to remind his students that history is certainly teacher of life, but who also has very few students! Instead you, of "students", in a broad sense, have many - as you, Father, said -: you have them in seminaries, in pontifical universities, in conferences, in study meetings, and also in the magazine, of which you have me paid tribute. So you are giving a valuable help to the study of history and its magisterium: thank you for this service and for this passionate testimony. In fact, history, studied with passion, can and must teach much today, so disrupted and thirsty for truth, peace and justice. It would be enough that, through it, we would learn to reflect with wisdom and courage on the dramatic and evil effects of the war, of the many wars that have troubled the human journey on this earth. And we do not learn! Italy - and in particular the Italian Church - is so rich in testimonies of the past! This wealth should not be a treasure to be jealously guarded, but must help us to walk in the present towards the future. The history of the Church, of the Italian Church in fact represents an essential reference point for all those who want to understand, deepen and even enjoy the past, without turning it into a museum or, worse, in a cemetery of nostalgia, but to make it alive and well present in our eyes. But - as you teach me - at the center of history there is a Word that is not born written, it does not come from man's research, but is given to us by God and is witnessed first of all with life and within life. A Word that acts in history and transforms it from within. This Word is Jesus Christ, who marked and redeemed so deeply the history of man to mark the passage of time in a first of Him and a later of Him. And the full reception of his saving and merciful action should make the historical believer a scholar who is even more respectful of the facts and of the truth, delicate and attentive in research, a coherent witness in teaching. It should keep him away from all the mundancies related to the presumption of knowledge, such as the greed of career or academic recognition, or the conviction of being able to judge facts and people by himself. In fact, the ability to glimpse the presence of Christ and the path of the Church in history make us humble, and they take us away from the temptation to take refuge in the past to avoid the present. And this was the experience of many, many scholars, who have begun, I do not say atheists, but a little 'agnostics, and have found Christ. Because history could not be understood without this strength. Here then, dear brothers and sisters, my wish: that your not easy magisterium and your testimony help to make contemplate Christ, the cornerstone, who works in the history and in the memory of humanity and of all cultures. And that He always gives you to taste his saving presence in the facts, in the documents, in the events, big or small. Above all, I would say, the facts of the humble, the last, even they actors of history. And this will really be the main road to have perhaps a few students next to him, but really good, generous and prepared. I would not like to finish without a memory for Father Giacomo Martina, whom I mentioned, and to say the experience I had with him. I was introduced by an Argentine Jesuit, not Italian, Father Ugo Vanni: they were friends. Then I went to see Father Martina, and he always advised concrete things: "Read this. Read that other ... ". And so I was thrilled to read the story, and I also had the patience to read the whole story of the Popes of von Pastor, thanks to these tips. Thirty-seven volumes! And he did me good. I thank you again for this meeting and I warmly bless you and your work. Please do not forget to pray for me.